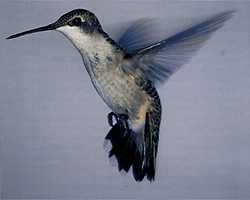 The Ruby-throated Hummingbird is by far the most common species that breeds in the eastern half of North America, although most states have sporadic Rufous sightings, and Bob and Martha Sargent have banded eight other hummingbird species as winter visitors to five southeastern states. Ruby-throats are intensely inquisitive and thus easily attracted to feeders, where males in particular typically display aggressive territoriality toward rival hummers, other birds, and even insects such as bees, butterflies, and sphinx moths. They quickly become accustomed to human presence, and will swoop down to investigate red articles of clothing, possibly as potential food sources. Feeders hung at windows attract as many visitors as ones farther from structures, and the bird that claims a feeder as its territory may spend much of the day perched nearby, guarding the food source against intruders. Many hummingbird watchers find "Hummer Warz" endlessly entertaining, although the chases are obviously serious business to the hungry birds. For a short period immediately after fledging, a female will tolerate the presence of her own young at the feeder, but they are soon treated the same as other adult birds - as rivals in pursuit of the food necessary to prepare for the fall migration. Courtship is apparently very brief, if it exists at all, and once mated the female raises the young alone. The walnut-sized nest, built by the female, is constructed on a foundation of bud scales attached to a tree limb with spider silk; lichens camouflage the outside, and the inside is lined with dandelion, cattail, or thistle down. The nest will stretch to contain the growing nestlings, and may sometimes be reused (rebuilt) the following year. Two white, pea-sized eggs are laid two or three days apart, which the female will incubate from 60 to 80 percent of the day for 12-16 days. Reports of the duration of the nestling phase vary from 14 to 31 days, the wide range possibly varying with the availability of food; 18-23 days is normal. when they leave the nest, the chicks are considerably larger than their mothers: they may weigh 4.5 grams, while poor Mom is down to only 2.5 g after the stress of raising them. Since the mother starts incubating the first egg as soon as it's laid, that chick will hatch and fledge earlier than its sibling; it will remain close to the nest until the other chick is ready to fly. After leaving the nest, fledglings are fed by their mother for about 10 days. It is thought that Ruby-throats live as long as 12 years, but the average is probably 3-5 years. Adult male: Emerald green back, iridescent ruby red gorget (throat) that may appear black under some lighting conditions, gray flanks, forked tail with no white. Smaller than the female. Adult female: Emerald green back, white breast and throat, rounded tail with white tips. Larger than the male, with longer bill. Juveniles: Young of both sexes look like the adult female. In August and September, young males may develop some red spots in the gorget. Molts: One complete molt per year, which may start during the fall migration and continue into March. Young males acquire full ruby gorgets during their first molt. Gender identification is simple if the light is right: the brilliant red gorget of the male is unmistakable. More commonly, though, the shape and presence of white on the tail is a more reliable field mark. 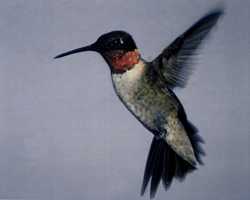 Ruby-throats breed throughout eastern to midwestern North America, from southern Canada to the Gulf of Mexico. Most winter in Mexico, Central America, and on Caribbean islands, although a few remain in the Gulf states and the Outer Banks of North Carolina. Most researchers accept a remarkable non-stop crossing of the Gulf, taking 18-20 hours. They arrive at the coast in late February or early March, and follow the development of spring flowers northward, reaching my home in St. Louis on April 20 +/- 2 days. Males migrate earlier than females, in both directions; some adult males start south as early as JUly. Our female breeding birds leave here (St. Louis) in September, with the young of the year following; the last juveniles depart abruptly at first frost (mid-October). By mid-November the fall migration is essentially completed throughout North America. A fanciful and amusing myth has arisen regarding hummers hitching rides on other birds. For maps showing population distribution and trends, see the USGS species account. See also the Ohio Department of Natural Resources Profile.